It's All Cut and Die: My Creative Time 90th Edition Sneak Peek Day One!! My Creative Time 90th Edition Sneak Peek Day One!! Hello, crafty friends!! Are you all ready for another AMAZING release from My Creative Time?!! Today, we're taking a look at two different products which work VERY well together! 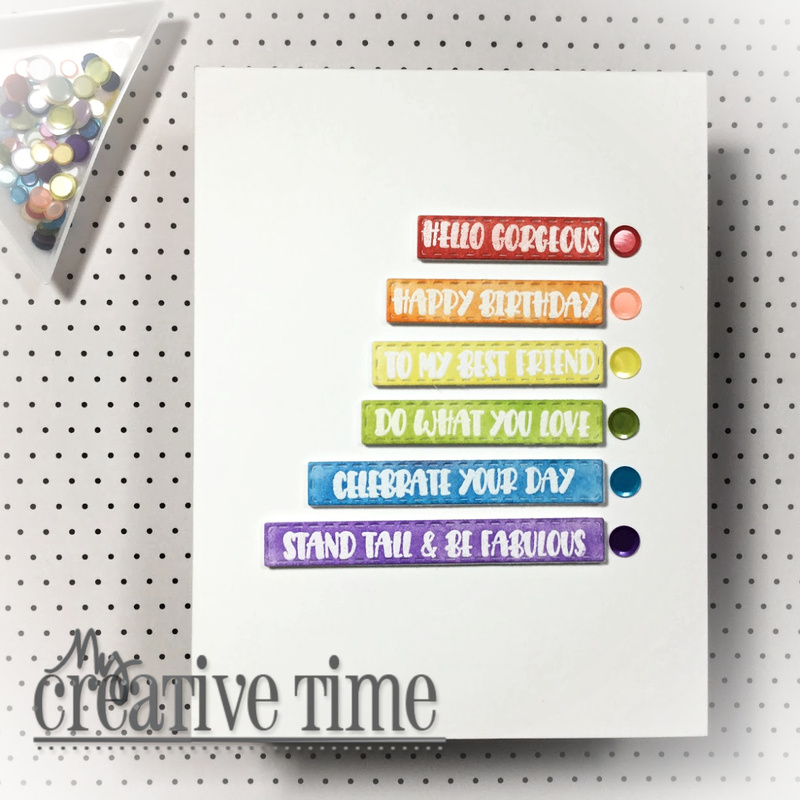 First is the Hello Gorgeous Stamp & Die Set. This is a beautiful stamp set featuring two flamingo images and includes some of the best sentiments, EVER!! Here's a look at what I made using the set. 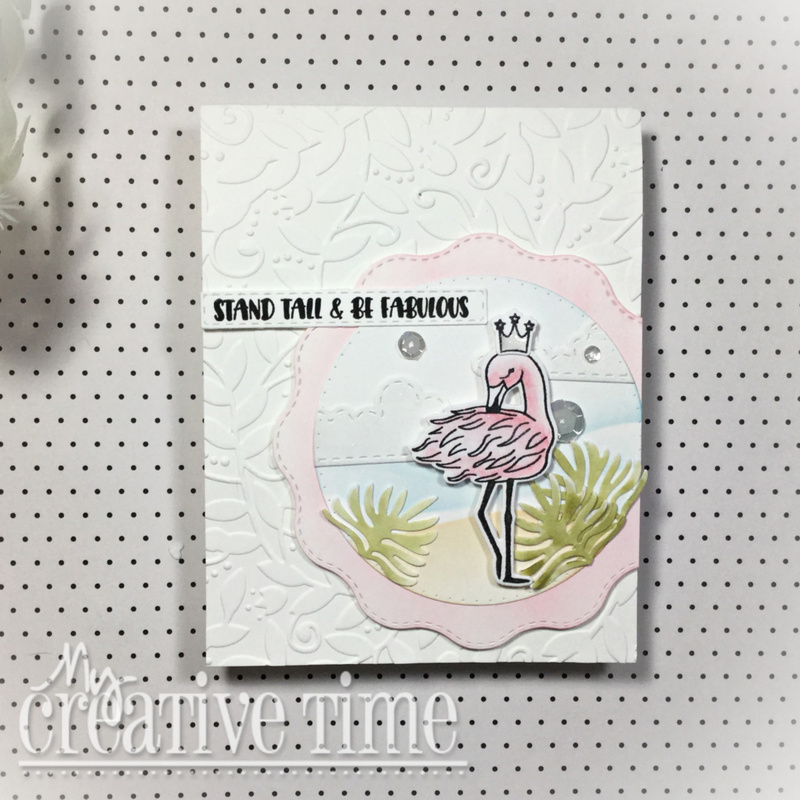 I created a little circle scene using the Bunch of Fun Circles Dies, the Floating Clouds Dies and the greenery dies that are included in the Summer Vibes Stamp & Die Set. I coloured everything with Distress Inks which was quick and easy. I layered the circle scene onto the largest die in the Bunch of Fun Circles set and before adding that to the card base, I used a leaf embossing folder on the front panel. I stamped the sentiment onto one of the new Strip Sentiment Dies. You are going to love these dies! They are so cute and not mention versatile. I even have a bonus project featuring these dies for you today! I finished this card off with a bit Nuvo Crystal Glaze and some clear sequins. Let's have a look at my bonus card! The sentiment strip dies come attached and for this project, that came in handy. When ran the dies through my die cutting machine using cardstock first, then a scrap piece of paper. The scrap provides a template which make it really easy to line the die cuts up on the card front. I white heat embossed different sentiment on the labels then used a rainbow colours of Distress Inks to blend over top. I did cut craft foam using the dies as well, for perfect dimension. 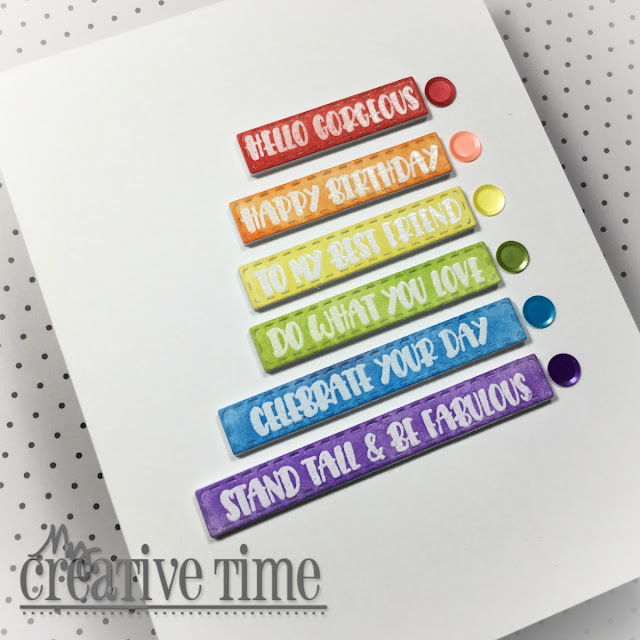 Then added some co-ordinating rainbow confetti to each sentiment strip. And that call that card, done!! This is a super clean and simple card, but so much fun!! We will be giving away the sets we are showcasing each day to ONE lucky winner! For example, the set we are Wednesday, Emma will announce the winner of that on Thursday and the set we are showcasing on Thursday, Emma will announce that winner on Friday (on the MCT Blog). All you have to do is leave a comment on each of our blogs. You are not required to comment on on every single blog, but the more you comment, the more chances you have to win! VERY IMPORTANT: Please leave a way for us to contact you when leaving your comment, just in case you are the lucky winner!! For extra entries, you can spread the word about this release by sharing it on Facebook, Tweeting about it or sharing on Instagram! Use the hashtag #mycreativetime. GOOD LUCK!! OMG Miss Laurie WOWIE WOW Your 1st card is so Gorgeous!! Loving your embossed background and the Little scene you created...it is absolutely Beautiful and so showcases your Precious Flamingo...I'd say you totally outdid yourself and your Bonus Card is Spectacular...What a Fun and Fab way to showcase the new strip dies and Sentiments...WOW Loving the colors and your enamel dots...absolutely Magnificent!! You so did a Super Incredible Creative job showcasing today's Sneaky Peek!! YOU SO ROCK!! Both of these cards are absolutely beautiful!! 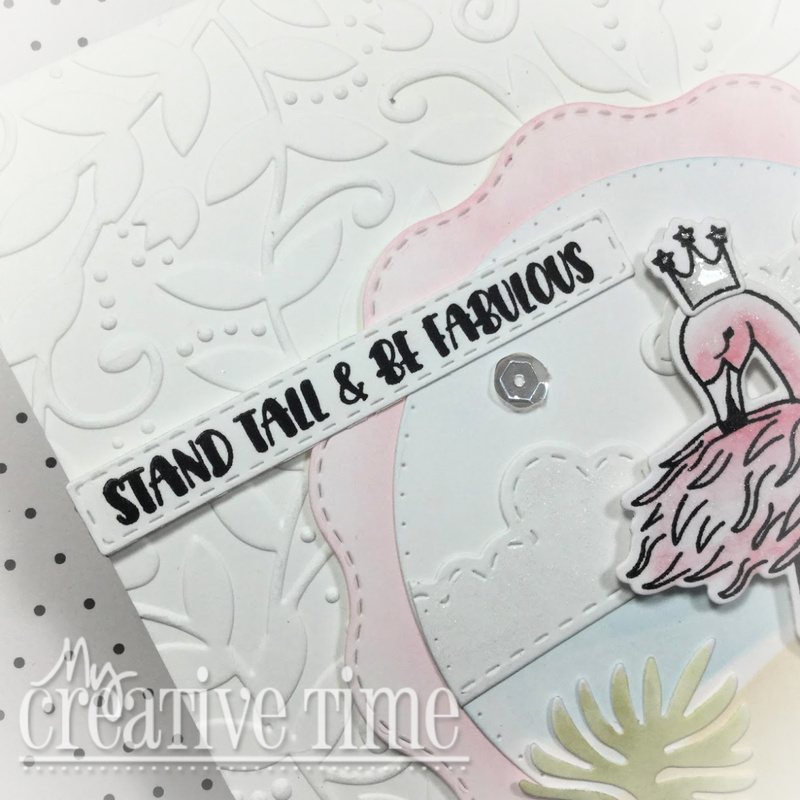 I love the embossed background and all of the coordinating dies you used!! Love all the details and your great colouring!!! I have always thought the flamingo looks so regal ... the crown is so fitting! Awesome cards. Love the rainbow of color on the 2nd card. Beautiful card designs and so colorful! I love the inspirational sentiments and beautiful birds in the new sets. Fabulous cards! 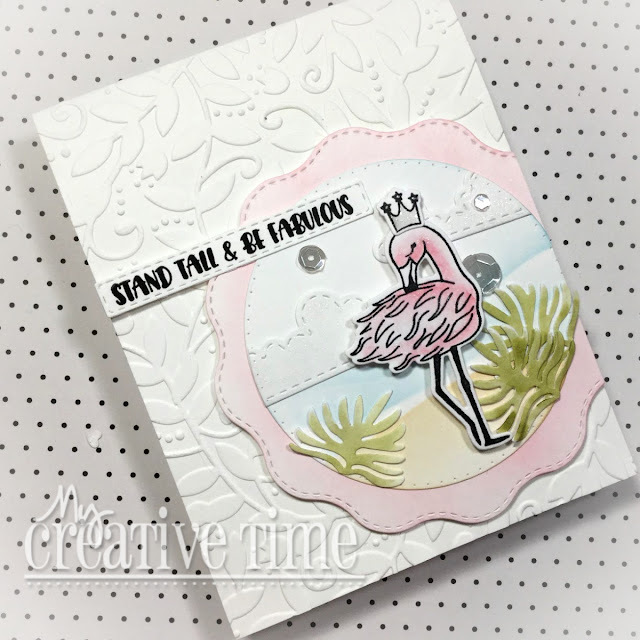 love the layering and details on your pretty flamingo card, and I love the way you used the awesome Strip Sentiment Dies on your second card! What a great idea! Love the colors too!